You may have heard that our nation is experiencing a shortage of healthcare workers in recent years, and even Florida is feeling the impact of this unfortunate situation. Across the state, patients have to wait to get the personalized care they need because home healthcare agencies can’t seem to keep up with the growing demand for Home Health Aides (HHA). At Pasco Medical Training, we believe that patients deserve to have access to the best care possible, and that means begins with industry-leading training. We are proud to offer Top Rated Local® medical training and HHA classes in Pasco that are accredited by the Florida Department of Education and the National Healthcare Association. We offer convenient on-site testing for students and have an A+ rating with the Better Business Bureau. Contact our team today to learn more! Why is There a Shortage of HHAs in Florida? There are more than 28,000 HHAs employed in the state of Florida, according to U.S. Department of Labor statistics. This makes Florida the eighth highest employer of HHAs in the country. Although it may seem like this number of HHAs would be more than enough to fill the need for professional home health caregivers, it sadly is not. There are many factors that contribute to the shortage of HHAs in our state, such as employee retirement and other typical turnover reasons, there is another factor to consider. Much of the baby boomer generation is getting to the point in their lives where they require assistance performing daily activities because of their age, injuries, or other physical concerns, and many individuals prefer personalized care from an HHA to that of nursing homes and hospitals. What is the Job Outlook for HHAs? 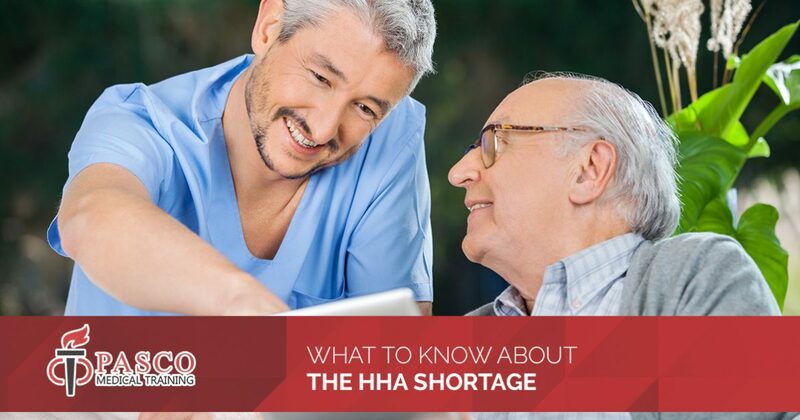 While the HHA shortage might be troublesome for home healthcare agencies, there is a silver lining for those individuals who are thinking about becoming an HHA. By 2026 the employment rate of HHAs is projected to grow as much as 41 percent to accommodate for the increase in our nation’s aging population. With high-quality HHA classes and training courses, this means that you could have a rewarding, stable career in the healthcare industry sooner than you imagined. Why Should I Become a HHA? Aside from the sense of personal satisfaction you’ll experience from helping others and the job security that comes from a career as an HHA, you’ll enjoy the freedom that comes with an independent working environment, providing care for your patients in their homes rather than in a more structured environment like a hospital or nursing home. HHA certification is often transferrable, allowing you to put your skills to use no matter where you live. Additionally, you’ll have the option of being an independent care provider or working for a home health care agency — a win-win situation! If you are ready to take the first step towards a rewarding career with undeniable job security, then enroll in HHA classes today! Our 75-hour HHA program arms you with the skills you need to perform your duties with confidence, providing Florida patients with the care they need and deserve. Our HHA classes go beyond basic fundamentals and offer unsurpassed instruction for quick completion. Start your HHA career with Pasco Medical Training today!